Keep on the great work. I’m using thunderbird for more than 10 years now (started around 0.1, when Scott was still in charge). And I can even keep using it in our office with exchangecalendar extension and use our exchangeserver. Still the best client (besides mutt of course) around. Honestly, I read this article with shock. So there was only one paid FTE on TB and now there is none? While some governmental organizations made the official choice to move to TB and at the moment we see it’s better to host your own email than to rely on large companies subject to governmental tapping and inquiries? No, sorry, I disagree, I don’t see this as increasing freedom and diversity on the Internet. I agree TB is something important wrt the Manifesto, I disagree with the fact that mission was correctly handled in the recent past. Thunderbird is basically orphaned and maybe it is time to think deeper of a commercial model able to provide TB with a minimal revenue stream funding one to two paid staff, long-term. The post mentioned our belief, in agreement with you, that Thunderbird needs one or more full-time, paid staff to maintain a stable, relevant product. The current plan to get there is to appeal directly to our users for donations, using a short-term but highly visible in-product campaign (like the Wikipedia model). This will hopefully occur sometimes in the next 6 months, and there will be further communications about this plan hopefully in subsequent posts. 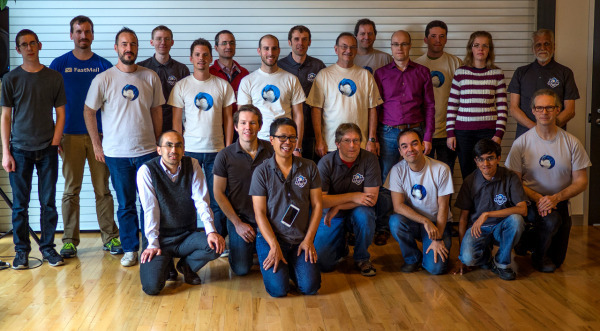 As to a “commercial model”, I’ve regularly brought that up as an option within the Thunderbird community (Google SwanFox for some two-year-old discussions), and led a session on that at the recent Thunderbird Summit. I could write an essay on that subject, but the short version is that the current Thunderbird Community is not particularly interested in participating in a commercial project, and without their support Thunderbird is unlikely to prosper. What is actually happening, and does seem to work, is that several companies that have a vested interest in the success of Thunderbird contribute some part-time developer resources to the open-source project. If we can add to those one or more full-time developers from our donation campaign, we could have a viable team. Mozilla is not going to allow TB to split off and start raising money. Even of it were possible mail clients do not have a good history of being able to crowd fund their operating expenses. The cost of a good developer plus a project manager alone will cost hundreds of thousands a year. Mozilla pays on average starting $75k a year with another $40-50k per year in health and other benefits each year plus bonuses. Other software companies offer more. Where will you find a decent team without those kind of funds? I think its time to realize Thunderbird is dead. Yep, those costs are about what I would expect. It remains to be seen whether fund raising is going to be viable. But even with the status quo, Thunderbird is far from dead. Our user base is rising, we have a strong volunteer team, and find that we are one of the players “at the table” when changes to email protocols are considered. As to “Mozilla is not going to allow TB to split off” – the issue here is that we do not want to split off, we want to remain part of Mozilla. With the existing new emphasis on fund raising with Firefox itself, it is hard to see why Mozilla would not allow Thunderbird to take the same approach. Hear Hear from the UK. I’m also a longterm user and believe TB is still the best all-round client. Glad to see you are incorporating Lightning at last! We must all accept that the best cannot always be free. Donations are not currently setup for Thunderbird. There is a donate link on the Thunderbird start page, but that is a generic donation to the Mozilla Foundation, not a specific donation for Thunderbird. Thanks to everyone working on Thunderbird! I look forward to (finally) having a way to chip in financially to further this important work. At the moment, Mozilla has two mail clients: Thunderbird and E-Mail (the Firefox OS app). I wonder if there is any long-term plan of merging them, providing a kind of Thunderbird app through the Marketplace, to be used both on mobile and desktop. Has anyone heard anything on the subject? Has the topic been discussed at the Toronto summit at all? There are two sides to the relationship between the Firefox OS email mobile app, and Thunderbird (a desktop app). One is branding, a second is technical. From the branding perspective, while I don’t have any direct, private access to any Mozilla discussions about branding, the impression that I have is that there is no interest at Mozilla in taking the Thunderbird brand and trying to apply it outside of the current desktop app. From a technical perspective, you could either have some sharing of features between the two apps, or sharing of underlying base code. There has not been any interest in shared features. As to base code, Joshua Cranmer has been writing some code that he hopes would be usable by both the Firefox OS email app and by Thunderbird, but that has not happened yet. In short, there has been little activity in combining the two apps, and there is not likely to be any activity for the foreseeable future. Thanks for the reply, Kent. I have to say that I am a bit surprised: as a user, I would love to have an integration of the two services (such that, for example, I would not need to configure my mail accounts twice). I guess that Firefox OS is at too an early stage of developement, though. Also, thanks for the work you and the rest of the team are doing on Thunderbird! That seems like a good idea. If you hook up to the Firefox sync protocol, can you share new types of data like account settings with your other Thunderbird installations and hopefully also the FxOS mail app? That seems like a win/win for Firefox and Thunderbird if it’s doable. But I know nothing about the sync protocol. Excellent news, I was nervous about the future of Thunderbird as I’ve just come to love using it. I rely on it to keep my huge volume of mail organized. With Windows 8 and the clunky Outlook, I am finding more folks are asking about alternatives. Keep up the great work and look forward to seeing what happens in 2015!! Thunderbird needs an up to date adressbook with up to date syncing capabilities! I have been using thunderbird for years and frankly spoken, I love it. … after some years love gets rusty. Thunderbird has been a very good mail client, but things change. Being a mail client isn’t good enough any more. There has to be calendar syncronisation (solved good enough, but not perfectly by lightning) and there must be a modern adressbook with synchronisation (I expect at least a WORKING carddav solution) . Especially the last topic gave me the felling of “time to leave thunderbird” withing the last 6 weeks. I wanted to get rid off google and I had to realize: There is NO working solution that is comparable to Exchange/ Outlook or Google. All the OPensource stuff is just unusable alpha software. I tested some caldav and cardav servers and lots of clients. The servers in general had been quite ok. The caldav clients have been quite ok. The carddac clients have been … hard to say, but the answer is: completely disappointing. And thunderbirds performance? On a scale of 0 to 10 thunderbird got a minus 5! In short words: If you won’t improve the capabilities of thunderbird’s adressbook, you will lose more and more users. Not because thunderbird is a bad email client! No, you will lose them because the adressbook is a No-Go in the year 2014! I am a well educated user, not a programmer, so pls. don’t ask me to produce code. Just give me a product, I can use for another 10 years. And for that I need a working solution to host my data (events, invitations, contacts, contact groups) AND sync them with a server (in my case Baikal). Of course there are much more details (but it’s not good to make that post that longer). I just want to tell you: The best mail client without a good adressbook is dedicated to death. Don’t let tunderbird die! Really sad to see that nothing is planned for the address book. CardDAV needs to be implemented for the address book! Keeping our online services & local services in sync is a must & am really surprised that this isn’t a feature at the top of the list. Merging Thunderbird & Lightning feels like wasted time IMO. Oh well, hopefully one day. We certainly realize that CardDAV functionality is a critical missing feature of Thunderbird. The original plan was that former Mozilla Thunderbird staffer Mike Conley was going to completely rewrite the address book. At the summit, we discussed whether this was the best approach, and decided that it would be better to do this by making incremental changes to the existing design, as that is more likely to make progress. In any case, although we don’t expect to make any progress on this before Thunderbird 38, the address book is one of the top issues that we would hope to address with paid staff, should we succeed in raising funds. On a related note, in my ExQuilla addon the additional code to support a completely different address book type (Exchange Web Services) is about 2000 lines of code, so it might only be a few weeks of work to support CardDAV with the current design. Someone could probably write an addon to do this. Thanks for the update. This is the one feature that really hold Thunderbird back for me, but I still haven’t found a Windows Mail client that’s portable that can compete with it even with the slow down. Keep up the good work & hopefully we’ll all see the fruits of the devs labor soon. A huge thank you for this success and news – to all the team and everyone in charge + participating! I’ve been waiting years, wanting to use Thunderbird, unsure of its support and development. I punched the air in elation to read the news in this post – Thunderbird deserves it. mostly the news of >4GB mailboxes is HUGE, as that’s the single immense barrier keeping me from migrating my POP email store to Thunderbird. Huge news to hear the 4GB limit will be worked on and broken through soon! I hope it comes with tools to check and fix mail store consistency. If so – I’m waiting to migrate to Mozilla here! Kent James has been active in Mozilla Thunderbird since 2007, working mostly on backend code affecting message folders and filters. He is currently serving as the Chair of the Thunderbird Council. Kent is the principal of MesQuilla LLC which makes the ExQuilla Thunderbird add-on, providing support for email and contact sync using Microsoft Exchange Web Services.